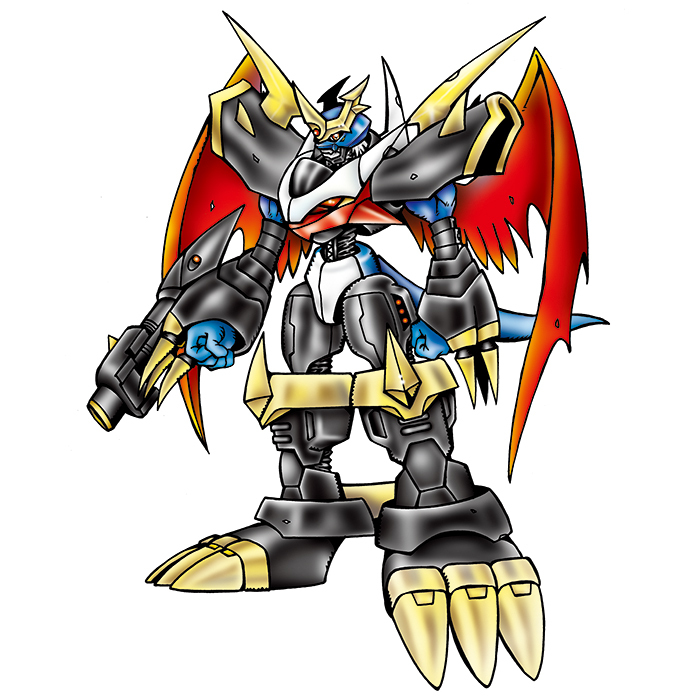 A form of the Ancient Dragon Digimon Imperialdramon: Dragon Mode that liberated all of its power, changing form into the legendary Fighter Mode. 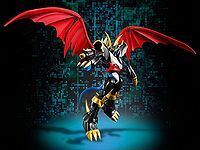 It is an ultimate Digimon that acquired a great intellect by changing from the difficult-to-control Dragon Mode to a human form. It is said that the power to destroy a planet dwells in its attacks. 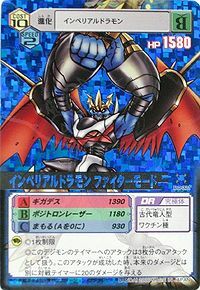 Its Special Moves are the "Positron Laser" equipped to its right arm, and inserting the Positron Laser into the dragon-face on its chest, then emitting all of its body's energy as a destructive energy wave (Giga Death). 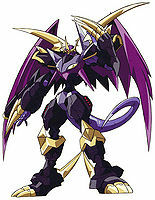 Its power is ten times that of Dragon Mode's "Mega Death". 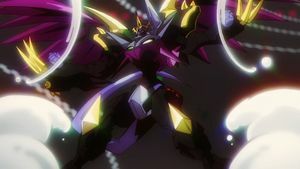 Also, when it awakens to perfect justice, it is able to transform into an even further Mode. 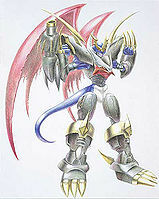 A form of the Ancient Dragon Digimon Imperialdramon (Dragon Mode) that liberated all of its power, changing form into the legendary Fighter Mode. 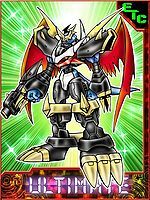 It is an ultimate Digimon that acquired a great intellect by changing from the difficult-to-control Dragon Mode to a human form. It is said that the power to destroy a planet dwells in its attacks. 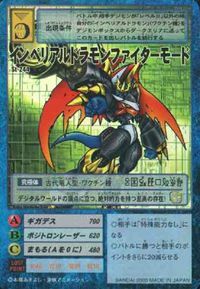 Its Special Moves are the "Positron Laser" equipped to its right arm, and inserting the Positron Laser into the dragon-face on its chest, then emitting all of its body's energy as a destructive energy wave (Giga Death). 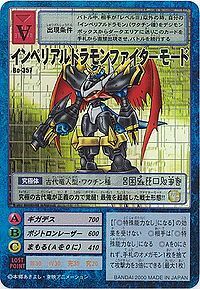 Its power is ten times that of Dragon Mode's "Mega Death". Also, when it awakens to perfect justice, it is able to transform into an even further Mode. Its overall attack power has increased due to walking on two legs. 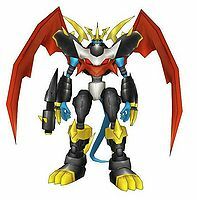 — Digimon Adventure 02: "Invasion of the Demon Army"
Paildramon's Ultimate level evolved form. 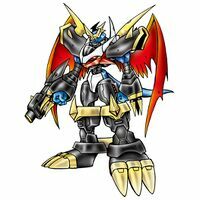 It stands far above other Digimon in terms of presence and abilities. 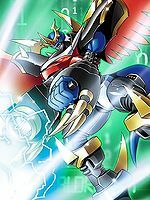 A powerful Digimon that possesses both power and intelligence. Title: 「究極竜戦士」 — "Ultimate Dragon Warrior"
| Imperial means regal or majestic. | Dra is short for Dragon (「ドラゴン」 Doragon). | Fighter means an individual who fights. 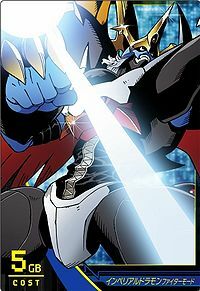 Anime/Manga Digimon Adventure 02: "Invasion of the Demon Army"
It fires an energy beam from the cannon on its arm. 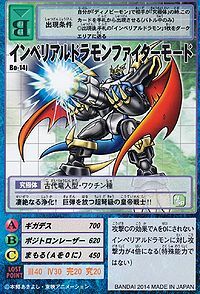 ギガデス Giga Desu Giga Crusher Summons a huge cannon and fires all its energy from it in a destructive energy wave, or fires a large ball of black electricity from the cannon in its chest. Slashes at its opponent with the claws on its wrist, or creates an energy blade to slash with. スーパーポジトロンレーザー Sūpā Pojitoron Rēzā Supreme Positron Laser A more powerful version of Positron Laser. イオンブラスター Ion Burasutā Ionic Blaster Releases an emitter from its chest that charges a bolt of energy that explodes. Slashes with the claws on one wrist. Dashes forward, stabbing with the electrified claws of one wrist, sometimes followed by a powerful kick. Flips, bringing its heel down on the enemy. Shoots forward through the air with one knee outstretched. Drops from the sky onto an enemy, punching them. Creates a shield of energy from the cannon on its arm that it can also use to encase opponents. 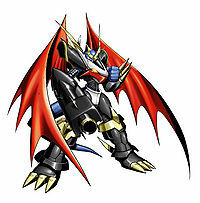 Combines its Positron Laser with Imperialdramon: Dragon Mode's to deal immense damage. First appeared in Digimon Adventure 02 - Episode 43. 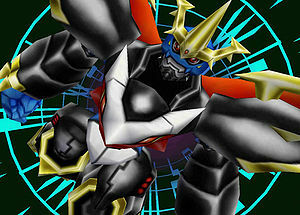 Imperialdramon Fighter Mode is the Jogressed partner Motomiya Daisuke and Ichijouji Ken. 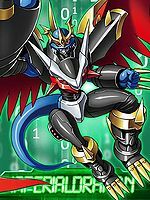 The Digimon partners of the first generation of Chosen Children gave Imperialdramon their power to evolve to Perfect, received from Qinglongmon, to enable him to Mode Change to Fighter Mode and defeat Skull Satamon. Imperialdramon Mode Changes to Fighter Mode in order to destroy the trio of Venom Vamdemon. Imperialdramon Fighter Mode in Digimon Adventure tri. 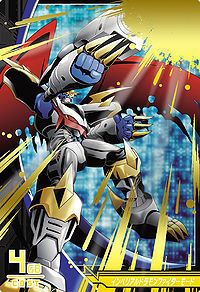 An Infected Imperialdramon Fighter Mode is commanded by the Mysterious Man (in his Digimon Kaiser disguise) in "Determination". It evolves into this form from its Dragon Mode after Palmon and Gomamon ultimate-evolve into Rosemon and Vikemon, and is evenly matched with both of them. Even though its blasts nearly overpower the two, Leomon ambushes and stuns it, leaving it wide open to be destroyed by both Rosemon's Forbidden Temptation and Vikemon's Arctic Blizzard hitting it at once. Can be evolved from Fladramon. DORUmon: By finishing the quest Seal the Souls and sacrifice a Defense Rom Delta in only 10 minutes in Very Hard Mode. Agumon: By finishing the quest Card Retrieve with 1 HP remaining in Very Hard Mode. V-mon: By finishing the quest Seal the Souls and sacrifice a Defense Rom Delta in only 10 minutes in Very Hard Mode. Guilmon: By finishing the quest Card Retrieve with 1 HP remaining in Very Hard Mode. Can be evolved from Paildramon if above level 53 and Holy EXP above 40000. 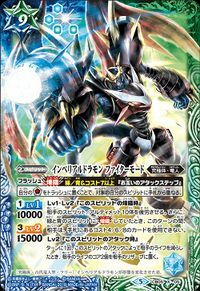 Can be evolved from Paildramon if above level 60, friendship 90%, and already befriended Imperialdramon, or can be found at Task Canyon if you accomplish the quest mission "The Challenge From Gaia Origin!" from Commander Glare, after you finish the game once; however, he'll only appear in Sunburst. 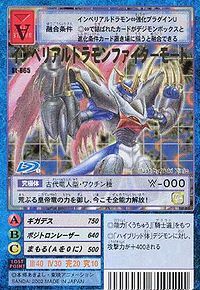 Imperialdramon Fighter Mode can only be obtained as a collectible card. 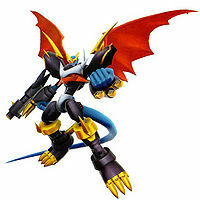 Imperialdramon Figther Mode is the partner of Kuga Yuuya. 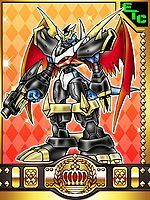 It is also an obtainable Digimon which is evolved from Paildramon, and can evolve to Imperialdramon: Paladin Mode by Jogressing with Omegamon. It can also be obtained as a collectible card. 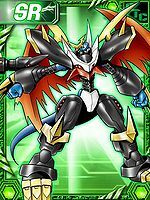 Imperialdramon Figther Mode is an unlockable Super Form which can evolve from V-mon or Wormmon. It can also be obtained as a collectible DigiCard. 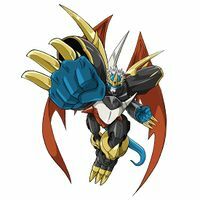 Imperialdramon: Fighter mode can freely Mode Change to and from Imperialdramon: Dragon Mode. It is also available as a Digimon Medal. 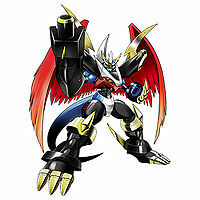 In the limited edition V-mon version it is one of the bosses of Area 1. Standing at the summit of the Digital World, this supreme being holds absolute power! Now that the savage emperor dragon is able to control its powers, it displays its true abilities at last! This ultimate ancient dragon is awakened by the power of justice! The Fighter Mode is beyond "strongest"!! The emperor dragon takes flight, reigning over even the skies with its limitless power! Violent purification! This supreme-class imperial warrior fires a giant bullet!! 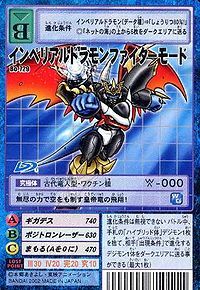 The Dragon Mode unleashed all of its power, transforming into a legendary dragon warrior and taking on this form. It has become able to control its power, which was so great that it was prone to being driven berserk by it. Note: This card was never released. 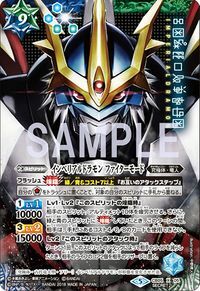 Imperialdramon changed its Mode, resulting in this form. 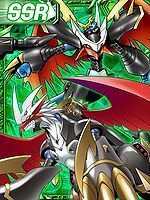 Digimon Adventure 02 Digimon Series: Acrylic de Card Digimon Adventure tri. ↑ Digimon Adventure 02: "The Last Armor Evolution"
↑ Digimon Adventure tri. - "Determination"
This page was last modified on 18 April 2019, at 02:31.